Or more from Nagasaki Airport. 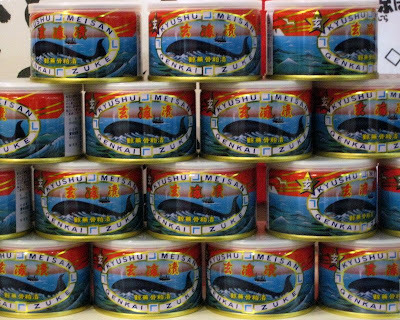 I seen lots of stuff packed in cans but this is a first...whale. 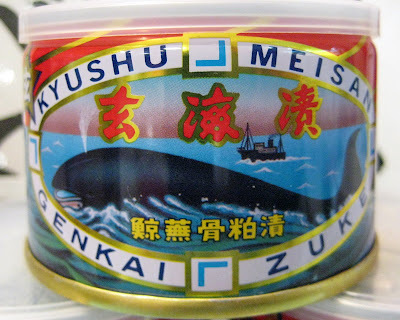 I'm assuming this is whale in a can because of the picture on the front. I'm still debating whether or not to buy a can of this just for the hell of it...great souvenir. I really doubt I'd ever open it...this stuff isn't real cheap. Just below the canned stuff is a refrigerated bin full of vacuum packed whale...never saw this before either. 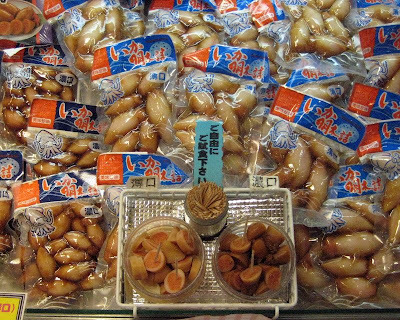 Also there was another bin full of packaged squid...at least that is what it looked like to me. 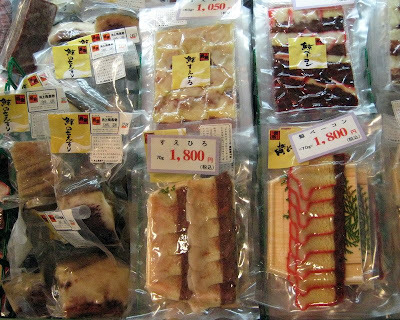 This one even had samples on toothpicks...I couldn't bring myself to try it. This is all in an airport. I guess some people buy this stuff as gifts. I've actually seen stranger stuff here and I'm sure I'll be taking pictures if I see more.